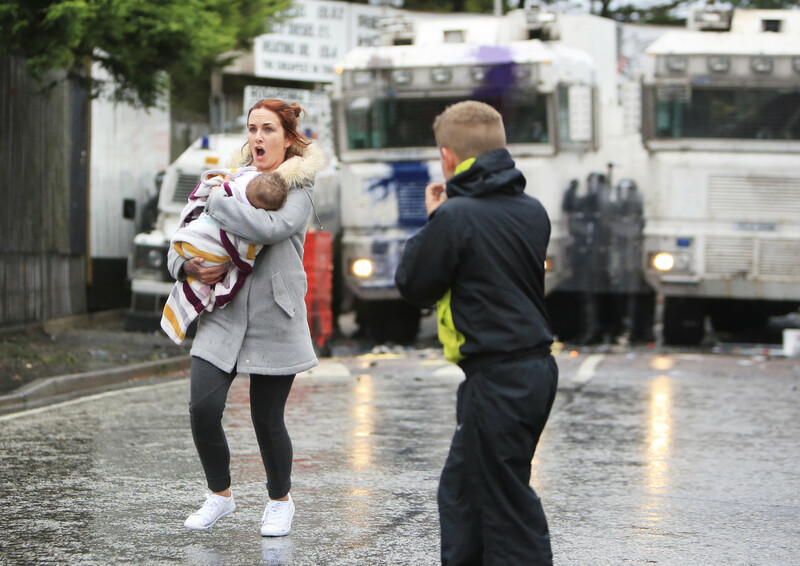 A young woman who was pictured clutching a baby in the midst of unrest in Rosapenna Street on Sunday past has said that she is “disgusted” at accusations that she brought her child to the frontline. Shauna Bradley is not in fact the mother of the child in the picture. She had gone to the aid of a friend and her seven-month-old baby after seeing the door of the house they were in catch fire. She said that she is now seeking legal advice. Social media sites and some mainstream media organisations wrongly claimed that Shauna had been irresponsible in carrying her own child close to where missiles and petrol bombs were being thrown at police in riot gear. Childcare worker and mother-of-one Shauna said she felt “sick to her stomach” at the online abuse she had suffered following the publication of the photo and the claims she was near a riot with her own child. She described how she and others had acted on instinct when they realised that a friend and her baby were in danger and she hit out at those who accused of bringing her child to a riot scene. “I went upstairs in the house in Rosapenna and put a blanket around the baby who was asleep and just ran,” she explained. “I had to cross the street away from the police lines because that’s where the missiles were being thrown. Thankfully someone shouted to the crowd what was happening and they stopped as we came out. The mother of the child, Alishya Campbell, who was visiting a friend when police closed off the Oldpark area, praised her friend for her courageous actions. Alishya was critical of the actions of the PSNI when trouble flared. “I asked the PSNI when they were gathering outside the house and before anything kicked off if we were going to be okay and they laughed and said ‘You’ll be safe in there,’” said Alishya. “When the trouble started I saw the flames and shouted to the PSNI that the door was on fire and me and my child were inside and he said ‘You’re alright.’ I then looked out the bedroom window and people were shouting up at me about the flames so I panicked even more and ran down and shouted again.